You’ve probably heard it; maybe you even thought it at one point. Maybe it’s because there’s so much public focus on obesity: people seem to assume that if you’re not overweight, you have no reason to worry about what you eat. After all, you’re thin, so you’re obviously doing fine, right? Thinness is the absence of one potential health problem, not the absence of all possible problems. Size is only the outside – there are all kinds of issues on the inside that can hide behind a Size 4. Just because you don’t immediately see the consequences of a bad diet doesn’t mean they don’t exist. And even if they aren’t there right now, there’s a case to be made for proactively preventing anything dangerous in the future. Thinness Does Not Equal Health. You can be thin and unhealthy at the same time. Just being thin is not a guarantee that everything is going great. You can be thin and have an autoimmune disease, diabetes (yes, thin people sometimes get diabetes, even Type 2! ), Irritable Bowel Syndrome, acne, depression or other mental health problems – or really, just about anything else. All of these diseases are modifiable with diet. 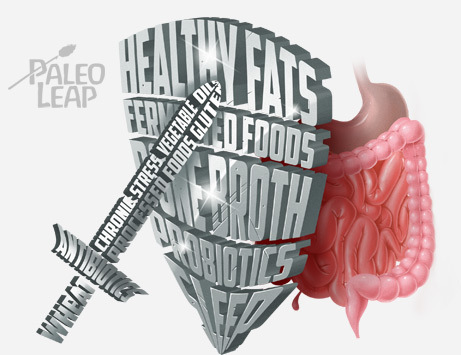 Paleo is a diet for restoring health, not only for weight loss. Your Weight Will Not Always Be Fine. The second reason why “I’m thin right now” is not a valid reason to keep eating poorly is simple: plenty of people are thin in their 20s eating whatever they want. But that doesn’t mean they’ll be thin forever. Thin people can have gut problems, too! Lots of college students can eat whatever they want and still be thin, especially if they play sports (that doesn’t mean they’re healthy, but they are thin). But so many people wake up one day at 35 or 40 and realize that they’ve suddenly gained 20 extra pounds because they kept eating for that bonfire early-20’s metabolism long after it was gone. Then they have to struggle to change decades of habits and learn a whole new way of eating – all while they’re trying to get ahead in their career, take care of young children and aging parents, and manage all their other commitments. Even worse, sometimes they ignore those 20 pounds, until they become 50 or 60 pounds by retirement age. 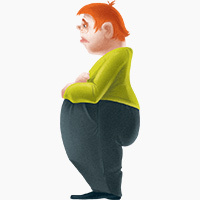 Then the chronic diseases start showing their ugly faces (especially metabolic problems like diabetes) and the consequences of that slow weight creep start to appear just at the time when it starts getting even harder to lose weight. This study found that the subjects tended to gain just over 1 pound per year. Starting at a healthy weight in college, that could easily end up driving this kind of steady yearly gain. Wouldn’t it be easier to start forming good habits before you “need” them? Wouldn’t it be nicer not to gain that 20 (or 30, or 40…) pounds in the first place, so you didn’t have to worry about losing it, plus the creeping health problems that came with it? The problem with both of these reasons to go Paleo is that they don’t “feel” very urgent. If you feel like you’re doing fine, and you don’t even have a frame of reference for what life is like when you’re not bloated after meals and don’t have awful hayfever every year, it doesn’t feel terribly urgent to upend your diet so you can feel better. Once they try it, most people can’t imagine going back, but until they try it, it’s hard to imagine what it will actually be like. What’s more, “you may have weight problems someday” is not very compelling to us because humans are chronically horrible long-term planners (if you need any evidence of this, consider that 36% of American adults have absolutely no retirement savings, including 25% of people over 50). We have a seemingly innate tendency to prioritize short-term pleasure over long-term benefit – and there’s no use getting all moralistic about it because that’s just how our brains are wired. If it’s a vice, it’s a vice we all share; some of us have just learned to manage it better than others. Commit to a set number of days “just to try it” instead of worrying about changing for the rest of your life. Think of it as an experiment – if it doesn’t work, you can quit and never look back. It really helps to do this with other people just for accountability – maybe your gym has a 30-day Paleo challenge or something similar. Once you feel the benefits for yourself, they’ll provide the motivation you need to keep going. Ask your parents, aunts, and uncles (and grandparents, if yours are still alive) about their health problems. Research diseases that run in your family specifically, and what kind of dietary strategies have shown some promise for preventing or managing them. This might help make them more real or urgent to you. Essentially, any strategy that rephrases the issue to yourself so that it’s more immediate will help make it more compelling. Weight loss is not the only reason to go Paleo. Eating healthy has benefits for everyone, regardless of BMI. For one thing, obesity is not the only food-related health problem in the world! We focus on weight because it’s visible, but plenty of equally dangerous problems don’t show on the outside. Also, just because you have no weight problems now doesn’t mean you never will: prevention is so much more pleasant than cure that it’s worth the switch just for that. The problem with these reasons is that they don’t feel very urgent, especially to our lizard brains. But hey, that’s why we have a higher intelligence above our lizard brains. So if you or someone you know is holding off on healthy lifestyle changes for lack of an immediately obvious weight problem, there’s no time like the present to find a way to make those changes important. Salt Cravings: What they Mean and Why They’re Important.